While the UC Browser is competing with the high-level browsers, UCWeb, which is expanding continuously, has updated its browser for iPad with new features for Social networking. UCWeb, which is a leading mobile browser developer, has announced the release of its flagship product UC Browser+ HD 2.3 for iPad. The update version of the browser comes with new features like Social Links besides a floating video player. The Social Links feature fetches posts from your social networks like Facebook, Twitter and LinkedIn and displays the URLs contained within the post in a pop-up window. With the glimpse from the pop-up you can know what your friends are sharing without having to navigate outside the current webpage. The UC Browser+ HD 2.3 for iPad has a floating Video player which when combined with the VideoS makes watching online videos very comfortable. You can watch videos while browsing and switch to full-screen when you want to. There are also stylish wallpapers for the browser. 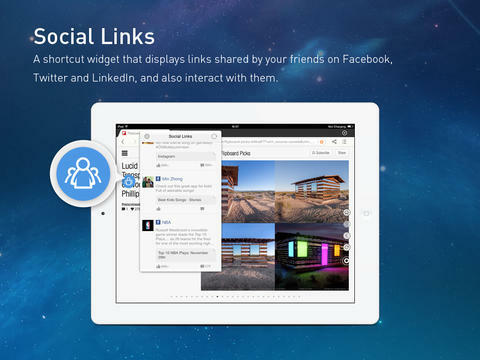 You can download the UC Browser+ HD 2.3 for iPad from the Apple App Store.